The US Department of Housing and Development estimates the average life expectancy for a sump pump to be about 10 years. However, there are many factors that can affect this lifespan, one of which involves proper maintenance — or lack thereof. Sump pumps can fail for a multitude of reasons, and taking a few precautions and educating yourself about your sump pump can help to maximize its lifespan and prevent serious issues. Here’s part one of our homeowner’s guide that will address some of the most common sump pump problems and how to prevent them. It’s important to correctly estimate the size of sump pump you’ll need to keep up with your home’s plumbing needs. Unfortunately, many homeowners make the mistake of getting a pump that’s too large because they think it’s necessary. But it’s actually larger sump pumps that cause issues because they have to work harder and will have a shorter product lifespan. A sump pump that’s too small for your home can also have issues, as it may not be able to sufficiently pump out the water. Most of the time, however, a smaller sump pump is just as effective as a big one. If you’re uncertain about the sump pump size your home needs, it’s always best to consult professional residential plumbing services for sump pump installation assistance. Any appliance will fail eventually with prolonged lack of maintenance, and sump pumps are no exception. That’s why it’s important to carefully follow the manufacturer’s instructions for maintenance — some recommend running the pump every two to three months, while others recommend a yearly regimen completed before the rainy season starts. Other common maintenance procedures include replacing the battery on the backup pump, checking for proper operation of the float to make sure it’s not restricted, cleaning out the air hole located in the discharge line, and listening for unusual noises that may indicate further issues. As always, contact plumbing companies or a plumbing contractor if you feel as though anything is abnormal. 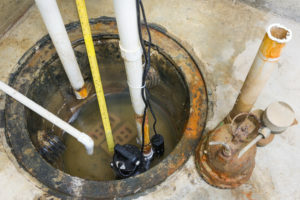 Ultimately, understanding how to prevent these common sump pump problems and hiring residential plumbing services for maintenance assistance can help you maximize the longevity of your plumbing system’s lifespan. Keep an eye out for the next post, where we’ll discuss some more common sump pump problems and how to avoid them.